Photo by Luca Bravo on Unsplash. Consider this: last year commercial aviation became the safest it’s ever been. There were zero accidental deaths in the commercial airline industry. Zero! As an industry, digital product design is optimistically headed in a similar direction: fewer disastrous or harmful and otherwise unpredictable outcomes for those who use the products we build. The way we’re getting there is surprisingly similar to how the airline industry has progressed over the last century too. Back in 1972—one of the most dangerous years to fly commercially—there were more than 2,300 accidental deaths on commercial flights. How did we get from thousands of deaths a year to zero? The answer is, in-part, by crashing. In the world of flying there have been things we just cannot predict. To improve, whenever an accident occurs the airline industry has gotten really good at slowing down and analyzing whatever it is they can about the crash. They look at crash data to determine how they might improve pilot training, the aircraft, or the procedures and processes that get planes up into, and back down from, the air. Was there some foreign obstacle in the way? Visibility low? Miscommunication with the watch tower or other pilots? Was the pilot fatigued? Dramatic changes in wind or altitude? Was there a mechanical problem: in the bulkhead, with hydraulic lines, or landing gear? A shift in temperature which affected navigation or aircraft components? US Airways Flight 1549, photo via nydailynews.com. What’s learned through each analysis causes sweeping changes to the industry: safer and better built airplanes, better forecasting tools, better training for pilots and attendants, improved technology to warn pilots when they’re dangerously close to an obstacle or when they’re off course or experiencing a sudden change in pressure or altitude. All the lessons learned over many years have slowly improved the safety of commercial flight. The reason for this is simple enough: not every factor that has led to a crash could have been predicted or prevented. Experts could have spent hundreds of hours discussing possibilities and still not discover something that may cause an accident to occur. Unfortunately there have been—and will continue to be—certain things we will only ever become aware of through crashing. What made 2017 commercial aviation the safest it has ever been are years of crashes and the changes that each invoked. Today we’re seeing a similar trend in the world of digital product design: a maturing and slowing down of how the work gets done. Unfortunate and hard lessons from with unforeseeable events have caused digital designers to become more thoughtful, considerate, as well as empathetic to those we build digital products for—all billion+ of them. We’re looking to more humanistic design leaders. The digital product design industry needs leaders who put empathy, inclusion, and a humanistic vantage into all parts of the work they do. No longer is it reasonable for design leaders to merely advocate for “average” users, emphasizing an arbitrary quality bar that appeals to many but fulfills the needs of only a few. These design leaders know they can’t simply be data-driven, but instead they must be data-informed and make decisions from data that’s paired with empathy and diverse perspectives. They know that data can’t empathize or feel. Leaders in digital product design are those who are willing to pull on a thread in order to uncover where an experience might fail, cause harm, or otherwise negatively influence real people. Abstract Director of Design Heather Phillips, with independent artist Jessica Hische, Dropbox Design Director Anisha Jain, and Dropbox Editorial Director Tiffani Jones Brown, via Designer Fund. Because the digital world has scaled so rapidly, what were once edge cases or outliers are now primary audiences for what we build. We need leaders who are consistently aware of—and capable of dealing with—the possible outcomes of what gets built for people on the edges. This is particularly true as the way we interact with digital products continues to evolve and become more immersive: in virtual and augmented reality. Who are these new design leaders? They’ll be easily identified by their past experience in the digital product industry, and they’ll know how to best leverage technology alongside their teams to design well-crafted experiences that won’t break or cause harm when utilized at the furthest edges. They’re the ones who are used to designing at a global scale. Of course these leaders are also the ones who will hold themselves and their teams responsible for what they build. They’re loudly proclaim when something broke or caused harm, and their plans to remedy it through design. They’re in this work to make a positive impact at global scale, not to merely push out software updates or set a new trend. Building improved tools of empathy. Technology now allows product designers to effortlessly explore edge cases and real-world scenarios without slowing down. It’s no longer sufficient to create an aesthetically pleasing design using tightly controlled or understood scenarios when the real world is often much more complex, nuanced, and hard to predict. Dropbox has made a small step in this area by working on tools that help their designers build prototypes which feel more realistic—noisy and full of distractions—than perfectly polished and cleanly presented. 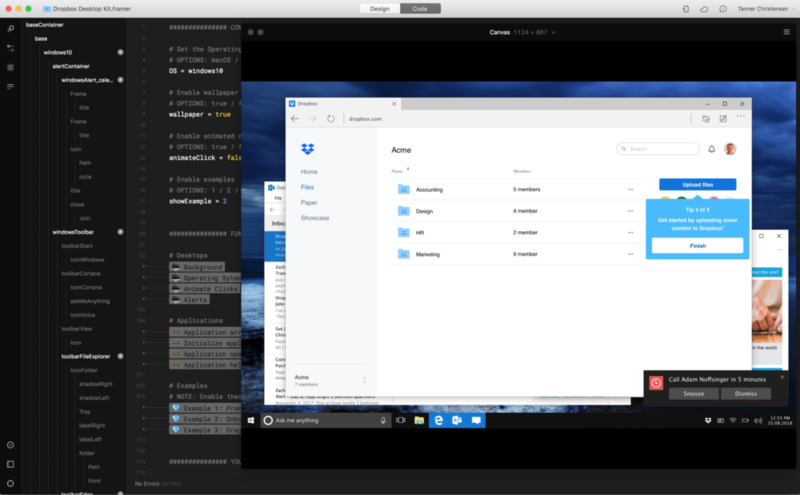 Dropbox’s desktop prototyping kit built for Framer. At Facebook, designers are given tools which can automatically pull in life-like data into their designs, including post and video content, photos, group or event names, and realistic personas. But the tools will soon go beyond that: by randomly incorporating data that includes placeholders of potentially offensive imagery or text, bad actors intended to do harm, or misleading content and error states. These things matter because they’re what real people encounter every day using the product being designed. A designer building a feature which might provoke, distract, or harm a person must be made aware of those possibilities, the software they use every day will now help them. In the coming year our tools will be able to further help designers by constructing accurate representations of users and scenarios across an unimaginably spectrum of audiences. And virtual reality promises to help us build more empathetically by enabling us to sit down in other person’s virtual shoes, far away from the comforts of our own. Beginning to construct foundational training. Digital product design is still a relatively new field of expertise. Digital product design as a career truly began with the personal computers of the 1970s but has since evolved into something entirely different, due to the explosive popularity of smart phones and app stores beginning in 2007. Because the digital product design industry—and the products we build —are so new, we haven’t been able to properly build training or educational materials for all the incoming designers. Universities have been famously behind-the-times, and now they’re expected to stay up-to-date with technologies that expand faster than the industry itself can keep up with. By the time a book on digital product design is published today all the tools and frameworks it mentions will already have been updated with major changes. Many of the books mentioning common software languages today are using outdated symbols or architectures by the time they get into reader’s hands. As a result: we’ve been teaching new designers to use old models and processes to tackle entirely new types of problems. It wasn’t until the middle of 2017 that anyone could say talk about what it takes to design a digital product for billions of people. Despite how easily a digital product can reach an audience of hundreds of millions of people, there isn’t much in the way of helping to educate the product creators about where things might go wrong, or what they should keep an eye out for, or how to scale. Thankfully we’re finally at a mature enough place for experienced product designers to share what they’ve learned. A foundation of training is emerging for design product designers, taught by those who have come before—Google, Facebook, Apple, Amazon, Salesforce, and many more. Covering everything from the basics of tools designed to create infinitely scalable interfaces, to developing a more holistic view of the product being designed and learning to develop critical empathy skills for those who will use it. Digital product designers are moving faster to resolve mistakes and launch fixes to production in real-time, we’re getting more engaged with the development of what we design and not just the aesthetics or flows around it, we’re building flexible systems that can meet the needs of diverse teams within and outside of our companies, and we’re beginning to drive business objectives toward alignment not only around metrics but also unquantifiable human needs. This is still very much uncharted territory, mistakes are going to be made and crashes are going to occur. We’re still getting used to having things in the air, but we’re at a point in our industry where there have been enough crashes to tell us what to look out for, how to improve, and how to build better products.